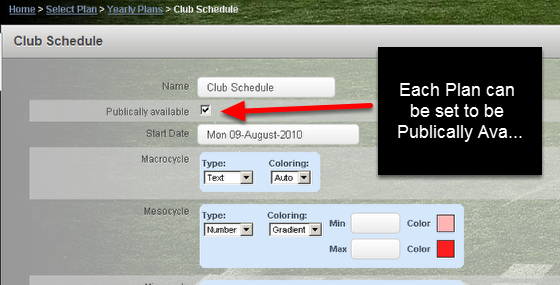 You could select to View an athletes plan and see what plans have been applied to the athlete (as shown in the image in the step below). 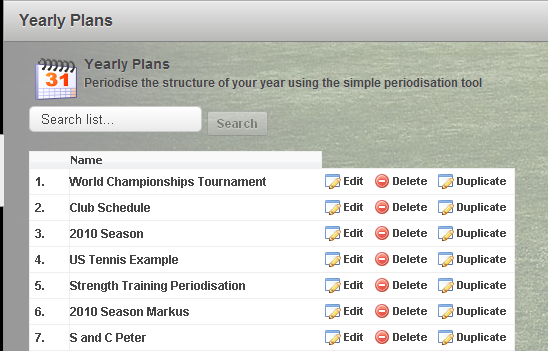 You can see which plans have been assigned to an athlete when you click on "Yearly Plans", "View Athletes Plan". You can open these plans and review them, but not edit them. 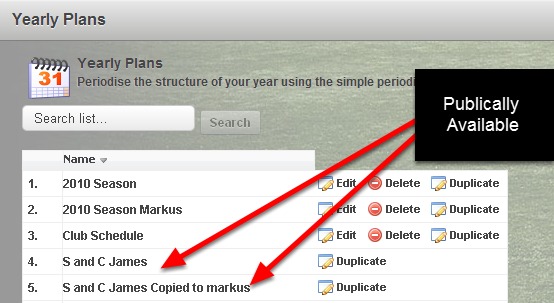 Now, you and other users can select to share your Yearly Plan templates so other can access and apply them. The image here shows two Yearly Plans that have been shared on this system. 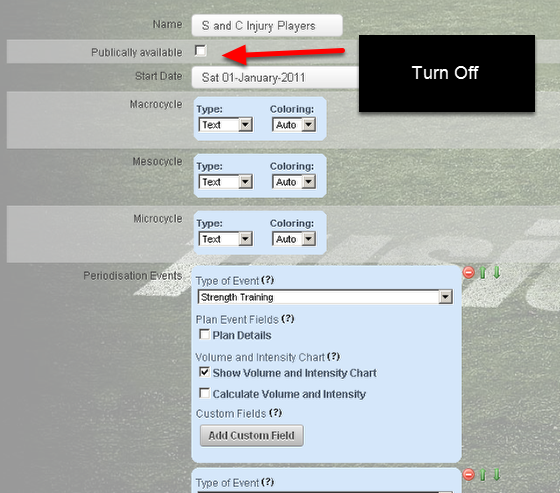 The Duplicate can be modified and saved and then applied to the correct athletes. Remember to turn off the Publically Available because it is a duplicate. You can select to Unshare your plan at any stage by ticking the Publically Available tick box. If someone has created a Plan with event/forms that you do not have access to, and you try and open the plan to enter data into it, an unexpected error will occur. We are working to fix this glitch and just enable you to view the event/forms that you do have access to. Unexpected Errors: If you duplicate a shared plan and a user does not have permission to access an event/form in that plan, when they edit the plan an unexpected error will occur. If you do not have permission to view/edit the event/form used in a yearly plan an unexpected error will occur when you open the duplicated yearly plan. This is because the yearly plan is trying to reference forms/fields that you do not have permission to access. You can remove any fields which you do not have access to (e.g blank fields) and continue to use the parts of the plan that you do have access to. If you remove the links to fields and forms that you do not have access to in the duplicated plan, you can save the plan and there will be no unexpected error. 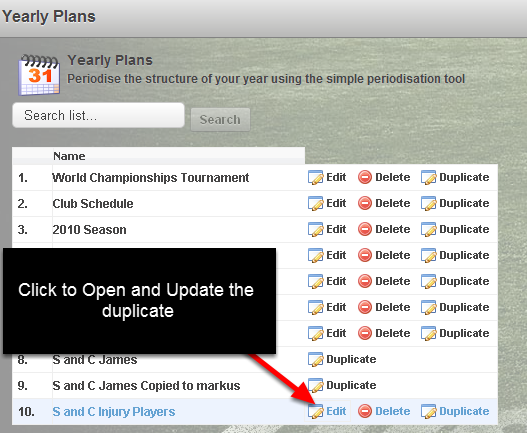 The example here shows that a Yearly Plan has been shared, duplicated and is now being edited. This user does not have access to the event/form 20m sprint. 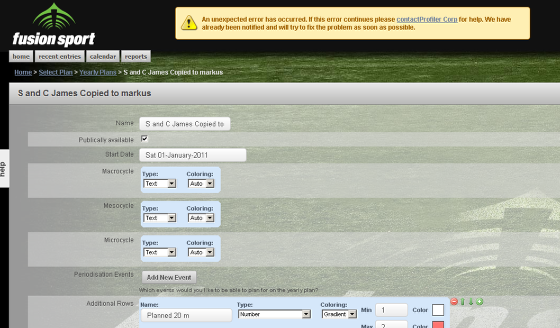 Once the plan references the fields that they do have access to, they can click next and save the plan. When the user opens the Yearly Plan, no unexpected error message will appear if they have correctly removed the links to the forms they don't have permission to access. 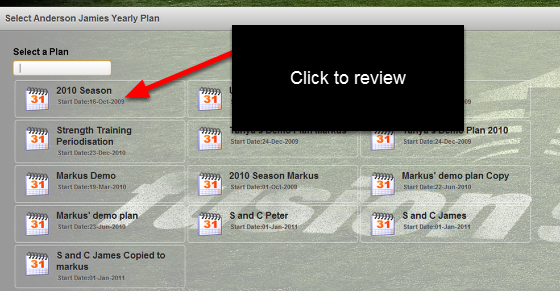 Prev: Yearly Plan "Start Day"